Brighouse Town’s slim play-off chance was dashed by a 3-1 defeat in their 42nd and final Evo-Stik NPL Division One game of the season at Clitheroe yesterday. Paul Quinn’s one-time leaders finished ninth, having registered more draws than any other team in the section with 17. 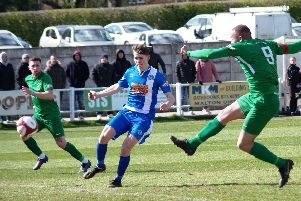 Lancaster City clinched the tile with a 5-2 win at Glossop North End while Farsley Celtic, Scarborough Athletic, Ossett Town and Colne filled the next four places and will contest the play-offs. Brighouse went to Clitheroe in eighth place, needing to make it four wins on the trot and hope results involving the teams above them went in their favour. They got off to a good start with a goal after eight minutes following a corner, Jimmy Pollard setting up prolific marksman Mike Fish to head home. Dimitri Tuanzebe turned the game around for Clitheroe, who have finished seventh, with goals in the 26th and 63rd minutes. Clitheroe had Charlie Russell sent off with 10 minutes left but still added to their tally through Alex Newby with a couple of minutes remaining.